Preheat the oven to 375 degrees. Lightly grease a 9x13 inch baking pan. In medium bowl, stir the softened cream cheese and green chiles together. Mix well. Add the shredded chicken, chopped cilantro and fresh lime juice. Mix to combine. In large nonstick skillet, melt the butter over medium heat, add the chopped onion and cook. Stir occasionally until the onion softens and starts to turn translucent. This will take approx. 3 minutes. Sprinkle the flour over the onions and stir well. Cook the onions and flour for 1 minute, stirring occasionally. Slowly stir in the chicken broth and milk. As you stir and the flour/onion mixture cooks, the flour will become less lumpy and the mixture will become smooth. Cook over medium heat until the mixture is bubbling and has thickened a bit, about 2-3 minutes. Remove the skillet from heat and stir in the enchilada sauce and sour cream. Spoon about a 1/4 cup of the sauce in a thin layer on the bottom of the baking dish. Fill each tortilla with a 1/2 cup of the filling. 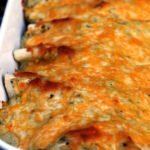 Top with a couple tablespoons of cheese for each enchilada. Pour the delicious white sauce over the top of the enchiladas and spread evenly with a wooden spoon. Top with the remaining cheese. Bake for 20 minutes until the enchiladas are bubbling and lightly browned. Sprinkle fresh chopped cilantro over the top of dish and serve immediately. SO good.